Another season of shenanigans is upon us and I love any excuse to embrace my inner Pagan! This celebration is all about that first spark of spring. We got to fill the house with candles and say hello to all the fresh green shoots, namely snowdrops and daffodils. My lovely husband gave me a candle making kit last year so with Imbolc in mind I finally gave it a go. It was really easy and the older boys loved it. Stood up to the stove melting the wax pellets in a Bain Marie and then choosing a colour (blue) to add. Oren, with his wee delicate hands and limitless patience helped thread the wick through the mould and secure in place with putty. It was a team effort. I told them stories about the significance of Imbolc in the seasonal calendar. We all agreed that the nights are definitely getting lighter now too. It’s still just as cold but there are plenty of new flowers peeping out of the earth. Spring is undeniably on the way and Imbolc is a lovely way to acknowledge it. Once the wax cooled a little I poured them into the mould and left them overnight. They turned out the next morning and look pretty good and very blue! The boys want to make more but in different colours now and try and layer them so that should be fun for a future weekend craft activity. Loki is learning how to say new words daily at the moment and his ever expanding vocabulary is really exciting. 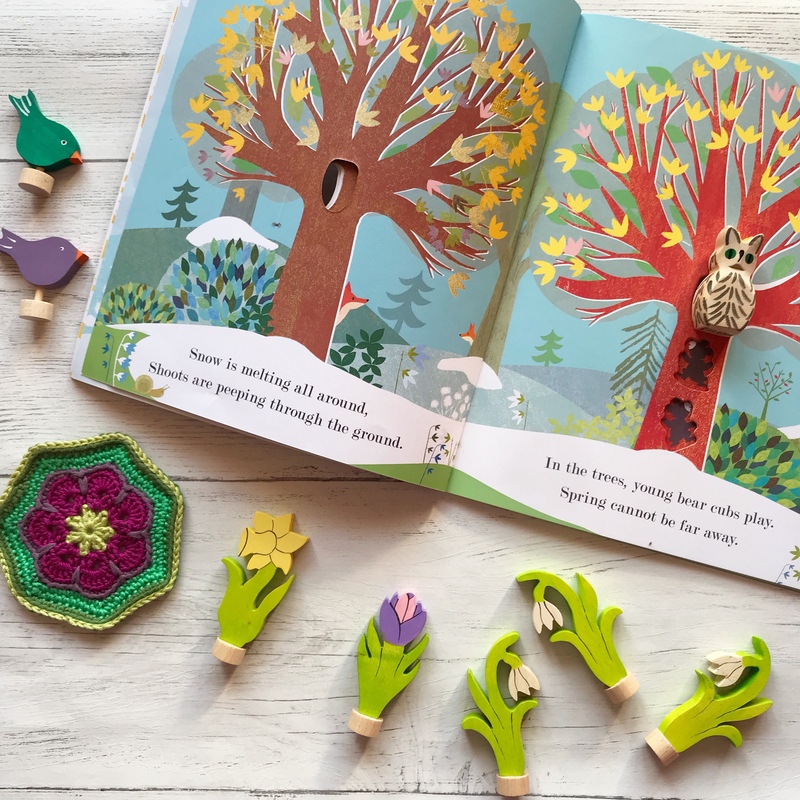 We made flowers with our Grimms wooden toys and after a few attempts he proudly pointed at them and said “fower” – it was genuinely adorable. Sadly, his brothers rather helpfully taught him how to say “bum” this week, which reduces them to fits of giggles and is not adorable at all when I get it shouted at me from atop the dining table! We changed up our seasonal display table and added all our flowers to the mix. Inspired by so many beautiful set ups I’d seen in the Babipur Facebook group and on Instagram we got creative with various green bits and bobs from our stash. I taught the boys the significance of certain flowers, herbs and colours for Imbolc and we made a wee altar before doing a blessing spell. The colours; white (snow) grass green, pinks and yellow for flowers – Grapat Spring Set is totally perfect for this. Sheep to represent fresh life – very relevant up here surrounded by sheep farms! Milk – white for purity and snow. The liquid of life from Mother Nature. Candles, lots of candles, to signify the returning light. After making our wee pile of goodies we blew out some candles and each said a wish that we hoped to be fulfilled before the end of Winter. I explained Imbolc is all about a fresh start to the year and how we traditionally do a Spring Clean before Winter ends. The fire festival element we embraced and we wrote down our worries and literally burned them with fire! It’s a lovely visual for the boys! Our spring cleaning has got a little out of hand. Now that I’m done with babies I can finally get rid of stuff! I have nearly 8 years of boy stuff just littered round my house. In the past 3 weeks we have gone through 27 black bags and either thrown out/passed on/donated/gleefully set fire to all sorts of nonsense from empty Lego boxes and books to bibs and baby socks! There is actually a term for it; Swedish Death Cleaning! My friend sent me an article about it (here) and it’s genius! All our old University Notes and papers thrown straight in the recycling. It feels amazing! We’ve cleared an entire 2 x 4 IKEA Kallax and have decluttered several rooms already. Before the end of Winter I want to gut the dining room and rearrange all my crafty stuff, sort the boy’s playroom and move Loki and all his toys in there and reclaim the living room as an adults only space again. I cannot wait! I am learning so much, you have such fun with your boys. I am going to try to rearrange furniture in certain rooms while cleaning to freshen things up and identify if I need anything.